Architectural Digest just put up the Top 10 Hotels from Sea to Shining Sea - and guess who topped the list?? 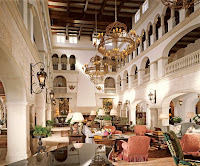 The beloved Cloister at Sea Island. Very impressive! In redesigning the storied resort, "the challenge...was that there was such a fond history." The rest of the list follows. 4. The Park Hyatt, Washington, D.C.